Raymond Moore has a string of fine southern soul songs to his name – often in collaboration with the great George Jackson – but on this one-off he turns producer and label owner as well, in tandem with Raymond Settle. Although “What A Man” is a strong mid tempo offering the other side is the one to go for. 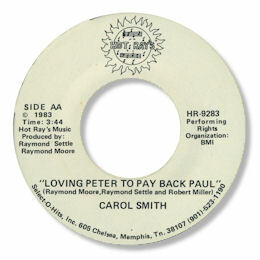 Loving Peter To Pay Back Paul is both lyrically inventive and melodically memorable and Carol Smith is breathily effective in getting the cheating message across. The alto sax solo is nicely judged and the synths are well throttled back thankfully. By the time this came out in 1983 the commercial 45 was on its last legs but Memphis music still had a thing or two to say. The track was covered with distinction by Gwen McCrae.